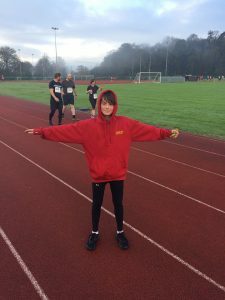 In a very busy and inspiring weekend of running, Okehampton’s Roger Voaden achieved a long held ambition to complete 100 marathon and join the exclusive 100 Marathon Club. 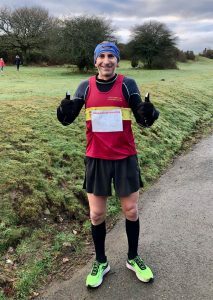 Having competed at such iconic marathons as London, Snowdonia and Lochness, Roger chose to run his 99th and 100th marathons at the quiet, low key but very friendly Plym Trail Winter Series at Clearbrook near Yelverton. Despite having collapsed and been taken to hospital from a bout of flu two weeks previously, Roger had recovered sufficiently to complete his 99th marathon on Saturday, finishing in 3.21.20 and ran his 100th the next day accompanied by three club mates whose presence he was very grateful for as he was still not feeling 100%. 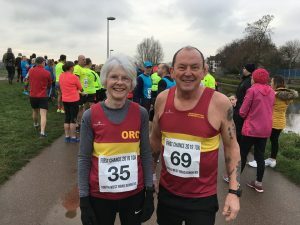 Two other ORCs also ran on Saturday, where unfortunately Geoff Hill had to cut his race short after becoming unwell and so only completed the half marathon distance. Monika Richards ran the full marathon finding this double out and back course tough going with the outwards 6.5 miles downhill and the return entirely uphill. She ran comfortably, not pushing herself too hard having entered Sunday’s race too, completing in 4.28.44. Sunday saw perfect conditions with no wind and sunshine for Roger’s 100th. He had chosen this quiet event as with typical modesty he had not wanted to make a fuss over it, so didn’t expect the turnout of ORC’s there to run with him on this special day. Andy Vallance, Jeremy Tandy and Rob Kelly were his escorts for the marathon, while Andrew Vernon, Geoff Hill, Jane and Derek Jackson and Monika Richards ran the half marathon. The marathoners ran comfortably enough to chat on the way round bringing Roger home in a time of 3.22.44 where he was greeted with champagne, a cake and a crowd of friends who had come to celebrate with him. He was later presented with his 100th medal by running legend Alan Littlejohns and the coveted 100 Marathon Club T shirt by the race director and fellow 100MC member Davey Green. Andrew Vernon and Geoff Hill put in great performances in the Half, coming home in first and second places respectively, this giving Andrew his first ever win at half marathon distance in a time of 1.29.47, with Geoff finishing in 1.31.55. Jane Jackson was in second lady position until the last 400m where she cramped so badly she had to stop and was overtaken by another lady, finishing eventually in 1.57.32 to complete her awards chart for the first time in six years. Monika had found her legs too tired to run a second marathon so ran a steady pace to finish the half in 2.05.18. Derek just used this run to put in some training miles, running with Alan Littlejohns to finish in 2.21.10. 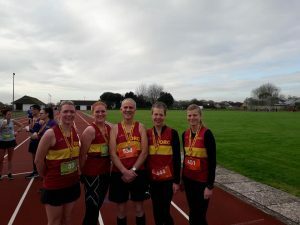 Sunday provided an opportunity for several Okehampton Running Club members to fill in some of the times missing from their award charts for the year. 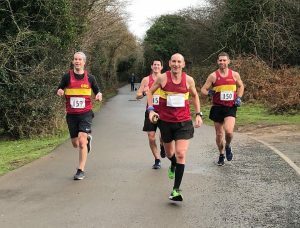 At the Braunton 10 there were two distance options on offer, the original Alby Tithecott 10 miler, and the newer Steph Irwin 10k. The 10 miler is one of North Devon Road Runners oldest and most popular races, with two infamous climbs and is not regarded as a PB course. The 10k route was introduced in 2017 follows some of the original course and still contains some similar challenges. Conditions on Sunday were near perfect for a January day, with no wind and relatively mild temperatures. 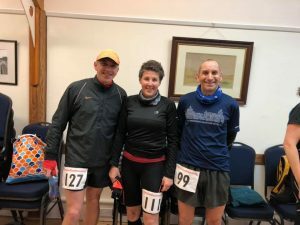 Okehampton had two runners in the 10 miler and both put in outstanding runs with Jo Page storming round in 1.11.20 to be placed third lady, while Emma Dean, whose running has massively improved recently, set a huge PB in 1.19.33. In the 10k there were also great performances, with Paul Evison setting a new club age group record and a PB with his time of 50.00 which earned him first MV65 too. The two lady runners both set new PB’s with Christine Fritsch coming 2nd FV45 in 55.29 and Kathryn Volkelt-Igoe 3rd FV55 in 1.00.08. Unfortunately for those who had chosen the fast and flat First Chance 10k, in Exeter, as an opportunity to set a good time for their awards, there was huge disappointment. All the competitors were notified on Friday that due to engineering works they had been unable to obtain an official measurement of the course so it would be classified as NAD (not actual distance) and therefore the times would not count for records or awards purposes. Some runners chose to withdraw but two ORCs still took part with Mike Westland finishing in 54.28 and Jane Richardson in 57.36. The previous day had seen some more great running by ORCs with two of our fast vets having a battle round the Tavy 5Kool 5k race. Paul Carter just managed to put a bit of distance between him and Stephen Sincock with Paul finishing in 19.04 and Stephen in 19.14, both running great races to be 5th and 6th respectively. Not forgetting Beck who got a new PB by 2 minutes (26:56). 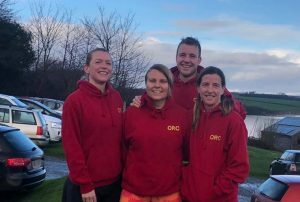 Five ORCs tried out the Tamar Lakes Parkrun on Saturday where Karen King set a new PB of 24.29 and Jo Page was second lady, Jo Bradford third and Karen King fourth. Error: Error validating access token: Session has expired on Saturday, 20-Apr-19 03:20:42 PDT. The current time is Monday, 22-Apr-19 11:12:09 PDT.